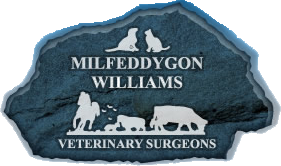 Williams Vets is a three centre family mixed veterinary practice which covers the Dysynni and Dyfi Valley’s. The practice treats all types of animals including pets, horses and farm animals. Cemmaes Road and Tywyn surgeries have fully equipped consulting rooms, kennels, operating theatres and X-Ray facilities. This allows us to deal with anything from suturing a wound to repairing a fracture with intramedullary pins or orthopaedic plates. Our Barmouth surgery is soley small animal consultations and pet supplies. We stock a large range of collars and leads, toys, bedding, Royal Canin food, etc. The Practice also has small and large animal ultrasound scanners, ECG machine and blood testing equipment to avoid the delays of using an outside laboratory. Williams Vets is dedicated to giving the best quality of care and making use of the latest technology in the diagnosis and treatment of animals. The vets are encouraged to attend courses and conferences to ensure the latest treatments and techniques are used where applicable on the cases they manage. We take particular pride in our friendly and approachable staff. We carry out our own 24 hour emergency care, so you can be sure that you will see the usual staff even out of normal working hours.